This special issue of Global Health Governance examines in detail a proposal that seeks to address many of these global health governance shortcomings: a Framework Convention on Global Health (FCGH). The FCGH is an international legal framework—grounded in the international human right to health—that would support health at the local, national, and global levels. Creating a framework convention that would establish a set of global health norms and an infrastructure to implement these norms is an attractive idea in a world where such large disparities in health outcomes persist. An FCGH seeks to marshal existing resources for health, coordinate between disparate actors in global health governance, set standards and goals for health outcomes, and solidify the centrality of the right to health in law and policy. However, this ambitious idea will be hard to accomplish given the complexities of international politics, resource constraints, and competing priorities. While there is widespread consensus that the existing infrastructure and capacity of global health governance is insufficient to solve global health problems, whether a framework convention is the right approach to improve governance is a matter of debate. The contributors to this special issue address these topics and explore the implications of an FCGH. The special issue begins with several articles that discuss the proposed normative content of an FCGH, outlining important substantive considerations that must be addressed. Brigit Toebes proposes a series of normative considerations for the FCGH that track closely to the norms established by General Comment 14 on the International Covenant of Economic, Social, and Cultural Rights—which comprises the most extensive articulation of the right to health—and builds on these existing norms to more firmly situate global health inequalities within the international agenda. The next two articles explore the challenges of financing global health and provide a series of proposals that seek to contextualize these financing challenges within developing norms of global health governance. Sharifah Sekalala describes the current state of financing in global health governance and proposes the recognition of extra-territorial financial obligations for national governments based on human rights norms. Her proposals include provisions for long-term funding mechanisms that are designed to be representative, participatory, and accountable. Jalil Safaei makes the case for viewing health as a common good, grounded in the normative imperatives of social responsibility, human rights, social justice, equity, and human flourishing.7 Recognizing the potential obstacles to achieving health equity, he proposes a funding mechanism—a global welfare fund—that could be integrated into or aligned with an FCGH. 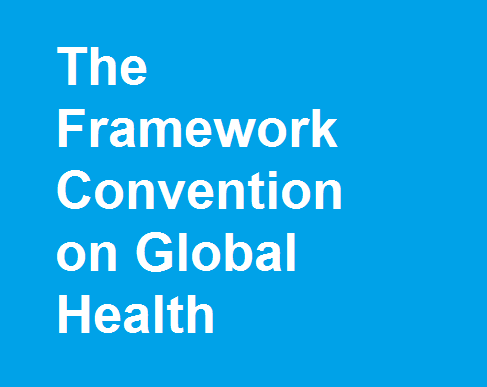 The proposal for an FCGH is situated within an energetic debate on whether a framework convention or other structures provide an appropriate model for addressing global health governance challenges.8 Three articles in the special issue explore these issues directly. Anuj Kapilashrami, Suzanne Fustukian, and Barbara McPake provide a cautious assessment of the FCGH proposal, highlighting the likely structural constraints and political pressures that make achieving global health goals difficult and advocating for a bottom-up strategy that gives primacy to the contributions and influence of local people and communities in developing global health norms and programs. They support this idea with several case studies that demonstrate both the perils of neoliberal policies driven by international institutions detached from local realities and the potential value of allowing people-led movements to develop applicable health norms. Sebastian Taylor also provides a strong critique of neoliberal policies, focusing his discussion on how market forces deter investment in infrastructure that will effectively reduce non-communicable diseases. His solution is to apply the International Health Regulation’s definition of “public health emergency of international concern” broadly enough to authorize international action to counter the impacts of non-communicable diseases. Debra DeLaet provides another critical assessment of the FCGH idea, finding the idea of establishing more international instruments in the form of a framework convention to be duplicative of existing international human rights treaties and likely to divert resources from other important global health efforts. In her view, the potential for redundancy and inefficiency outweighs the potential benefits of a framework convention. Under a legal regime established by a framework convention, implementation and accountability will be significant challenges, just as they are under existing models of global health governance. Where the institutional infrastructure for implementing a proposed FCGH is not yet clear, the next two articles in the special issue address the role of institutional actors in the design of an FCGH. Mara Pillinger proposes a broad application of the right to health that goes beyond traditional state obligations. The responsibility for protecting, respecting, and fulfilling the right to health, she argues, should apply to international organization as well as states and private actors. Florian Kastler outlines the case for why the WHO should be the lead agency in implementing an FCGH, provided that it undergoes necessary reforms to improve its capacity to lead effectively under a new framework convention. The final two articles in the special issue provide detailed analyses and recommendations for areas that would be covered under an FCGH. Belinda Bennett considers the cross-cutting linkages between women’s health, women’s rights, and human rights. Based upon this human rights analysis, she provides an extensive catalog of issues an FCGH should incorporate to ensure women’s health receives sufficient support in the framework convention and its subsequent implementation. Finally, Emilie Aguirre describes the connection between an FCGH, the right to health, and the right to adequate food. She offers suggestions for how the role of adequate food and adequate nutrition as a determinant of good health should be included in an FCGH. Taken together, the articles in this special issue shed light on numerous important questions within global health governance. This robust debate over the FCGH proposal appears at a fortuitous time. With the recent release of the United Nations’ Sustainable Development Goals as a backdrop,9 the FCGH Platform group has begun drafting initial language for what could become an FCGH and has been forming a collaborative group of participants that include international experts, national governments, NGOs, and local health and human rights advocates. Many challenges lie ahead for this proposal, and its success is far from assured. Yet, the aspirations and objectives of an FCGH challenge us to continue to work together to seek more effective and just models of health governance that will allow all people to live in better health.